← Six months. Two wheels. 50 GPS doodles. With thanks to the IOC for selecting my #OlympicDay 2015 contest entry as the winner, I’ll be seeing “Christ the Redeemer” up close during my trip to Rio de Janeiro this December! It’s been a very exciting week! On Tuesday, the IOC unveiled the winner of their 2015 #OlympicDay contest. And the winner, selected from among 21,000 #OlympicDay entries, was none other than my #OlympicDay GPS doodle! The prize: a trip for two to Rio de Janeiro in December for a sneak peek of the Olympic Park ahead of next summer’s Olympic Games. In addition to the 25.8 km recorded for this GPS doodle were ~25 more for some behind-the-scenes dot-connecting. 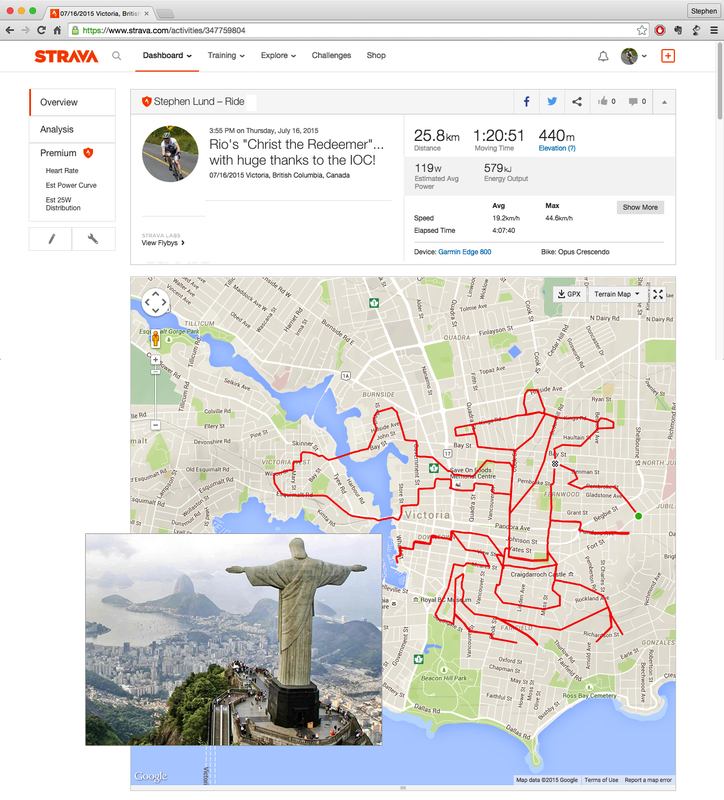 This entry was posted in bike-writing, gps art and tagged #OlympicDay, bicycling, Brazil, Christ the Redeemer, creativity, cycling, garmin, gps, gps art, International Olympic Committee, IOC, Olympics, Rio de Janeiro, statue, strava, victoria bc. Bookmark the permalink. Thank you! I’m totally thrilled…and amazed by the fact that they selected my #OlympicDay activity from among 21,000 entries!